I just did the first part of a “monthly review column” that I sometimes do, longer lists that we compile over at the “review” section of the website. Thanks for keeping up with BookNotes (at the blog, or on facebook or twitter) but–if your a real fan, or in need of fabulous, longer lists—please click on over to the review column from time to time. We have so many archieved, longer reviews or bigger lists to be found by clicking on the “review” tab. Or just click here. perspective, clarity, vision, and—yeah–fun writing. For those who like the fabulously-done, brief, The True Story of the Whole World by Craig Bartholomew & Michael Goheen (which is an adapted and abridged version of their essential—essential!—The Drama of Scripture) or who appreciate N.T. Wright’s vision of how the Bible stories are inter-connected. This captures that storied nature of the unfolding drama as a worldview-shaping narrative, walking us through the epic adventure of God’s rescue of the planet. Sound good? Check it out. I tell about a handful of others, too, including a few you really will be glad to hear about, I’d guess. Please feel free to pass it on to anybody you know who teaches, studies, or is interested in learning about the Scriptures. I tell you a bit about each one, and I think they are reliable, fun, feisty, and helpful. Just for instance, here is one of the books I list, Ruth: The Story of God’s Unending Redemption written by my friend, Dr. Robert A. Wauzzinski (Dordt College Press) $14.00. It is the only one that I listed, I think, that isn’t a full Biblical overview, but it is so very helpful, such a good example of how to read the Scriptures, that I had to list it. This book is more thorough than a typical small-group Bible study guide, but isn’t as big or tedious as a full commentary. I think this is truly a helpful sort of book—meaty enough for nearly anybody to learn something (smart guys and pastors, too—trust me) but not a scholarly tome. Perfect for busy folks, for Sunday school teachers, for adult classes or book clubs or anyone wanting to dig into a particular book of the Bible. More important than the size and format—brief and usable—is the insightful, inspiring, and at times, nearly provocative, content. As I explain below, this is a case study in a wise and faithful use of the Bible. It doesn’t reduce the text to a “moral lesson” nor does it make it merely about doctrine or dogma. It draws from more evangelical/conservative readings as well as more liberal/critical scholars, while being something considerably more than a balanced approach between the extremes. No, this is a full-throated and redemptively wise telling of a full-orbed tale, a story placed in the broader Story of God’s Kingdom a-coming, on Earth as it is in Heaven. Do you believe it—the gospel according to Ruth. Of course he is not the first to have this Christ-centered reading, but I think he unpacks it better than any of the other recent ones that we also commend, such as the good work of Iain Duguid, Dean Ulrich, and Carolyn Custis James, all who have recent books on Ruth. 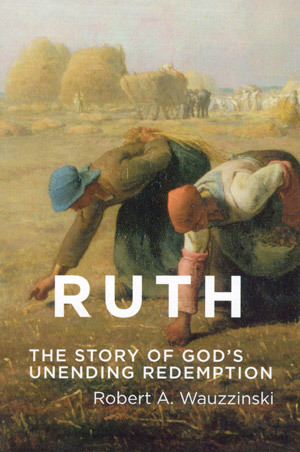 Ruth: The Story of God’s Unending Redemption Robert A. Story the Scripture tell. This book is exactly the kind of refresher we need. Bible in a way to hear God’s Word to us anew. We are not the only ones who highly recommend it. Two important things are going on in Ruth. First, one gets the wonder of the Book of Ruth with its’ ‘central character,’ the God of ‘cascading grace’ who is extravagantly displayed in this plot. Second, one gets a patient, self-aware pastoral pedagogy that keeps connecting the contemporary reader to the ancient narrative. The outcome is a narrative articulation of a vision of generous offers of unending goodness, offers that contradict the pervasive violence all around us. Readers are invited to a deep, welcome alternative, as welcome as healed humanness, as deep as the unswerving purposes of God. Bob Wauzzinski has served us well by reading the biblical book of Ruth in its full relevance for our current lives in society fraught with greed for self and lovelessness for the stranger…. (he) has given us a compelling way to understand how hearing God speak in this Older Testament book may help American’s today to cope not only with our evils of war and recession, but positively to reform our ways, if painfully, towards God’s blessing of shalom. …the unmistakable, powerful truth of the good news of Ruth is told with conviction. Lastly, I have to tell you–among friends, here at BookNotes—that we particularly like supporting projects like this. Bob has taught in prisons, done research an been an advocate for a Pittsburgh, African-American-owned urban bank, and is quite a fellow—few things would make us happier than to have him get some credit for this gift of good work, even though that isn’t his desire. And, we dig supporting faithful, little alt houses, like this small Dutch Reformed Iowa college press. Some of the bigger publishers gave Ruth very good thumbs up, but couldn’t imagine a book selling that was more than a “fill in the blank” study for small groups that had some academic cred, or an evangelically-minded author citing social justice stuff, or a serious scholar being so accessible for ordinary folks. I don’t know the publishing world, really, but this is a no-brainer in my book– the very sort of book we ought to be about. We hope agree. Let us know how many you want for your next small group or class. And don’t forget to check out the bigger list at the “review column” for June. Buy something over there and get an extra discount on Ruth. Almost like gleaning, eh?